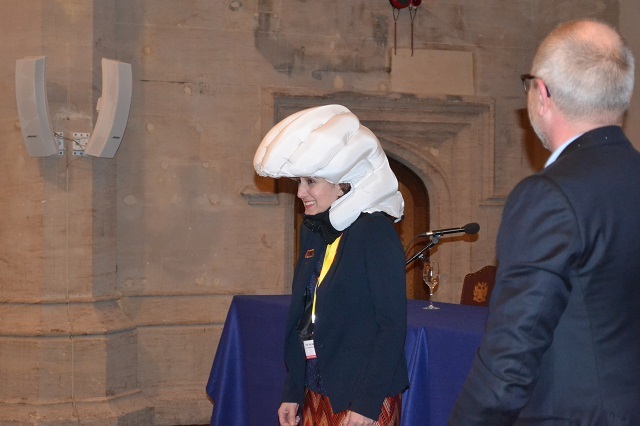 A recap of the London Road Safety Council’s Centenary Conference, ‘Safer Cities, Safer Futures’, which took place at the Guildhall, City of London, on 24 January. This page does not automatically update. Please click here to refresh and see the latest entries. 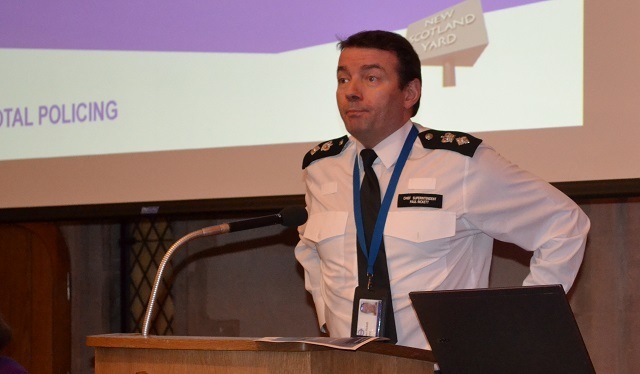 Detective chief superintendent Paul Rickett talks about the work of the Met Police’s Roads and Transport Policing Command. Summary: The Roads and Transport Policing Command oversees policing on London’s road and transport network. It works in partnership with, and is significantly funded by, Transport for London to tackle transport related crime, improve road safety, reduce the number of traffic related injuries and deaths on London’s roads. This presentation will provide an overview of the role of the Roads and Transport Policing Command in the Transport for London partnership for casualty reduction. It will also report on progress since the Mayoral target was set, and plans for the future. 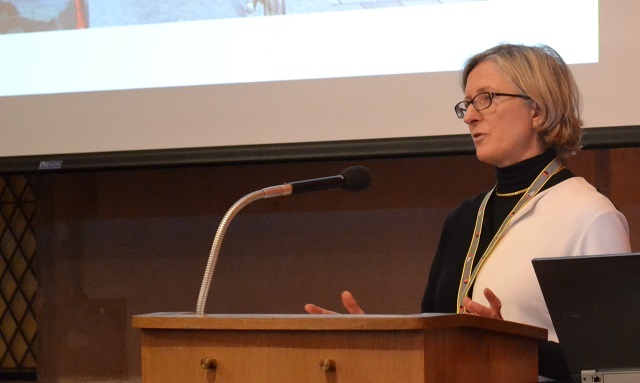 Cllr Heather Acton explains how her borough has managed to incorporate road safety in public realm improvements. Summary: In July 2016 Westminster City Council won funding to create a Low Emission Neighbourhood (LEN) in Marylebone. The purpose is to trial innovative ideas to reduce the number of vehicles and improve air quality. Walking strategy reviewed effectiveness of 20mph limits – no clear outcome. Concerns that signing only is not particularly effective. However, going to trial 30 20mph schemes around Westminster. Ask delegates when considering road safety schemes to consider air quality and public health. Fredrik Carling, CEO of Swedish-based company Hövding, presents ‘the world’s first airbag for cyclists’, including a demonstration. Summary: This presentation will explain how, through advanced sensors, Hövding can sense a cyclist’s movement patterns and will react in the event of a collision. The airbag will then inflate, fix the neck position and provide the world’s best shock absorption. Battery charged (10hrs), measure body movement 200 times per second. Champions League verses fourth division! Richard Cuerden, TRL, is talking to delegates about driverless cars and vehicle technology. He is providing a progress report on the various trials and initiatives currently taking place in the UK. Currently hoovering up data to compare what human drivers are doing compared to automated cars. GATEway – what can autonomous cars do for people with disabilities and can autonomous cars make deliveries? Crowds are difficult for autonomous cars – if we’re not sure vehicle will slow down – still not sure, it will stop. Ford will be mass-producing a car with no steering wheel or pedals by 2021. Were there any casualty reduction benefits in Hackney? Have speed humps been removed in Hackney? Are these schemes using pavement space for signs? Sandra Agbabiaka and Su Guy, Hackney Council, are talking about 20mph limits in their borough. Summary: In February 2015 a 20mph speed limit was introduced on main roads across Hackney. 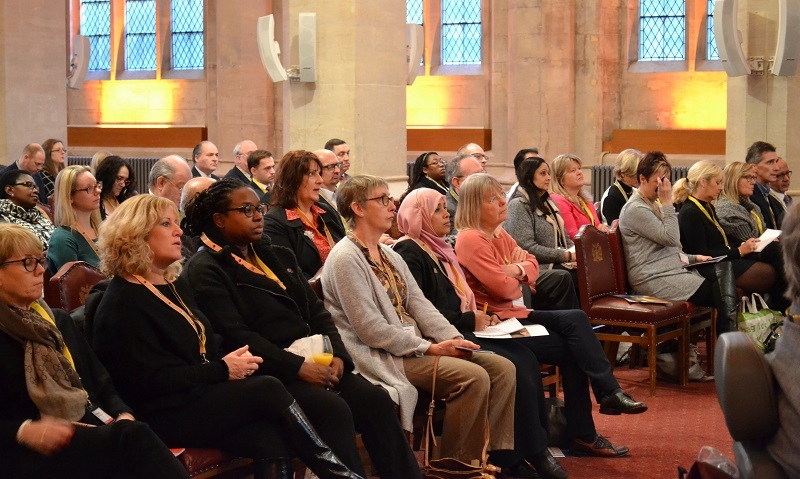 In this joint presentation Su and Sandra will look at the impact of this initiative, and pass on advice to road safety officers and elected members who may experience the introduction of a similar scheme in their borough at some point in the future. 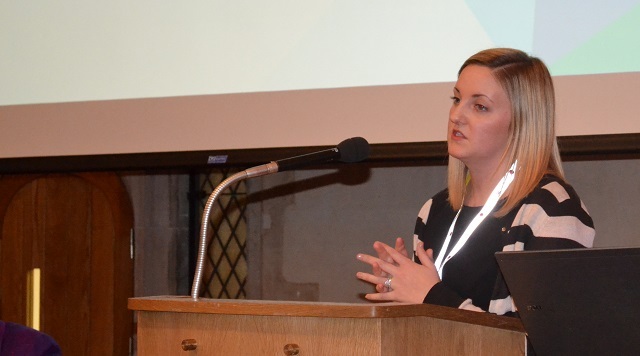 Nicola Glover from Atkins is presenting ‘Provision of 20mph Research – Purpose, Methodology and Early Findings’. Summary: While there is evidence suggesting that 20mph zones are effective in reducing collisions and speeds, there is an evidence gap on the effectiveness of 20mph speed limits. A large number of schemes are currently being implemented with limited understanding of where they work best, the factors contributing to their success, and barriers to delivery. The Atkins project will be important in informing future policy development on 20mph speeds and limits; as well as influencing scheme development and delivery, and wider transport policy. The early findings present the evidence gathered in the first year of the main evaluation phase. Looking at why schemes are being introduced and what impact are they having? Further analysis – speed data analysis in 12 case study authorities (level of compliance, average speed, effectiveness of limits over time, speed displacement impacts, effectiveness of limits v zones). Iain Simmons, City of London Corporation, will focus on road safety in Bank, and the infamous Bank Junction. Summary: Bank Junction in the City of London does not work very well. It is heavily used by all road users and has a high collision and casualty record that requires critical improvements. 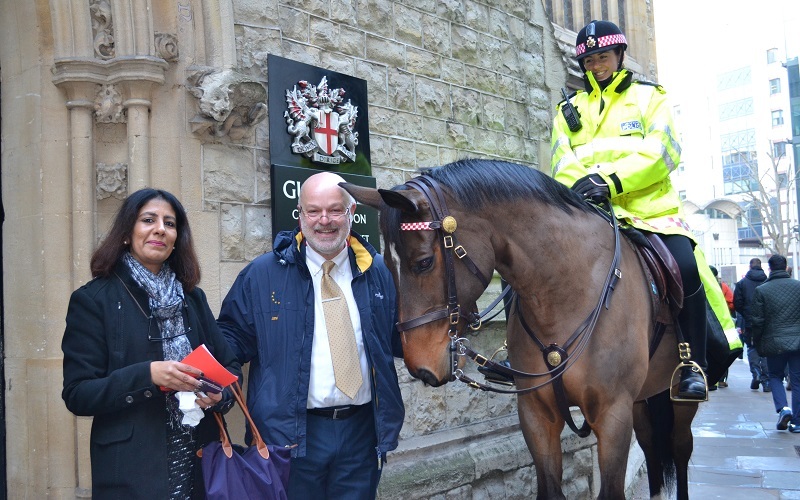 This presentation will give details of the ‘Bank on Safety’ scheme, currently being developed by the City of London Corporation to provide much needed safety benefits. Bank on Safety is expected to go live in spring 2017 while longer-term solutions are developed and consulted on. Mahmood Siddiqi is discussing how his borough aims to remove the tension between traffic and pedestrians, with a particular focus on Exhibition Road. Summary: Exhibition Road in South Kensington attracts 11 million visitors each year but until 2011, it was a car-dominated environment where most of the available road space was designated for moving traffic and parking. There is now significantly more space for pedestrians following the street’s refurbishment. This was achieved not through pedestrianisation but (controversially) by introducing ambiguity. This presentation reflects on the scheme five years on and asks whether it has opened the floodgates to more innovative public realm projects. Exhibition Road – a world class destination, major hub for tourists & residents – no easy task or ‘one size fits all’ solution. 80% dominated by car user with small strip either side for pedestrians, especially if mobility impaired. Objective – to make it inclusive and accessible for all, and bring pedestrian autonomy to the street. Collisions & casualties went down in three years post implementation, but would like to see greater reductions. Renewed confidence in the area & regenerated the area. Phil Jones and Lord Holmes of Richmond MBE, discuss shared spaces, including an overview of a review being prepared by CIHT. Summary: The presentation will summarise the new guidance note currently in preparation by CIHT (scheduled for publication later in 2016) on what has generally been referred to as Shared Space – although there is much misunderstanding and controversy over the use of that term. Three broad types of design: ‘Unstructured street’, ‘Less managed street and ‘Enhanced street’. Session one of the LRSC’s Centenary Conference is drawing to a close with a a question and answer session. We have had children’s road safety education for 100 years – where is the evidence that it works? Why is Redbridge Council cutting its road safety team? What is Waltham Forest doing to reduce risks caused by the mini-Holland programme? Mark Bland – We consult and discuss our proposals before going forward. We are not aware of any delays to emergency services attending call outs. We don’t want to introduce shared space – we prefer segregation. Copenhagen crossings – introduced to ensure vehicles give way to pedestrians & cyclists. Still early days, not much info in UK, we are monitoring. Have Waltham Forest measures reduced cycling on pavement? Mark Bland – Introduced 10 pedestrian & cyclist counters – we are monitoring – I suspect if we get the infrastructure right we will achieve this. Mark Bland presents the Mini Holland cycling programme in Waltham Forest. Summary: Mini-Holland schemes encourage more people to cycle, and cycle more often, with features that make cycling feel safer and more convenient. They also aim to improve streets and public spaces for everyone. The programme specifically targets people who make short car journeys in outer London that could easily be cycled instead. Waltham Forest one of three London boroughs awarded funding to increase number of cyclists. Key design features for new scheme include segregated cycle track, improved pedestrian and cyclist crossings, Copenhagen crossings at all side roads, reallocation of road space, bus stop bypasses, redesigned and simplified signalling at junctions. Looked for similar route to test infrastructure (less complex to Lea Bridge Road) where measures could be introduced more easily & quickly. Measures introduced are now being monitored – infrastructure been in place about 18 months, no collisions to date. Measures will then be introduced on Lea Bridge Road, taking into account lessons learnt. Liz Brooker MBE & Tanya Fosdick present ‘Delivering insights: understanding motorcyclist behaviour across London’. Summary: Road Safety Analysis has been working with a number of London boroughs analysing the types of motorcyclists who are involved in collisions on their roads and who live in their area. This analysis provides practical insights into who these riders are and how they can be engaged with. How were the findings used in Lewisham? The insight study matched what we wanted to do. Covering vulnerability, visibility, impairment, hazard perception & vehicle maintenance. Keith Prince AM from the London Assembly Transport Committee, looks at how to improve motorcycle safety on London’s roads. Summary: In March 2016, the London Assembly Transport Committee published its report into motorcycle safety, titled ‘Easy Rider: Improving motorcycle safety on London roads’. You’re never a true motorcyclist until you’ve fallen off! Motorcyclists account for 1% of traffic but 24% of casualties in London. Casualties mainly among young men riding mopeds – not enough is being done to address this. Giving motorcyclists to bus lanes causes problems – it’s a postcode lottery in terms of whether motorcyclists can use bus lanes – causes problems & confusion. Will be campaigning to persuade all boroughs to allow motorcyclists access to bus lanes. Dr Mike Esbester, University of Portsmouth, is looking at accident prevention in London since 1916, including a brief look at the LRSC’s history. Summary: This talk will look back at the LRSC over its 100 year history and show what steps have been taken to improve safety in London since 1916. Drawing on the LRSC’s archives and using examples of material such as posters, the talk will focus on the use of education to try to persuade people to change their behaviour. 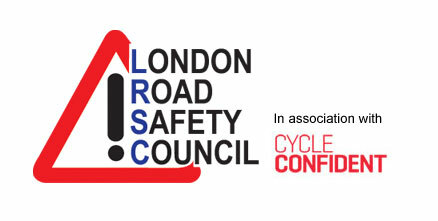 London Safety First Council (now LRSC) was established in 1916. Safety weeks were held across London during the 1930s – with variable success and participation across the boroughs. After 1945 some central government money was first made available for road safety work. 1966 – RoSPA produced Xmas wrapping paper carrying road safety messages. Would a greater awareness of past work help shape road safety delivery in the future? What role can the past play in informing the present and the future? Could past material be repackaged and used again in the future? 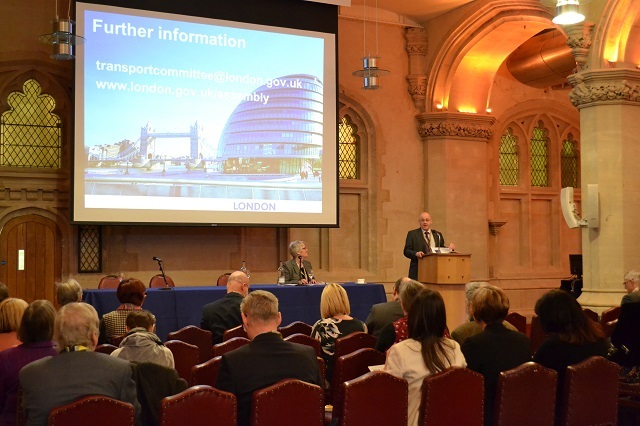 Leon Daniels, TfL, delivers opening keynote address: ‘Sources of Road Danger’. Summary: This presentation will set out how TfL, working closely with London boroughs, is tackling sources of road danger to achieve the target of halving the number of people killed and seriously injured on the Capital’s roads by 2020. 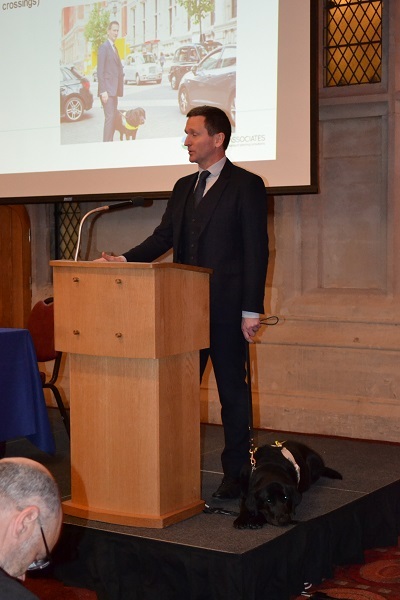 Our ambitious future programme includes Direct Vision Standard (for trucks), Safer Junction, collaboration with police on education and enforcement, and 20mph limits. We are delivering a broad programme of bus safety improvements, reducing the risk posed to other road users through a new bus safety programme. We are working in partnership to achieve Vision Zero for London…delivering road safety in collaboration with our partners. Technology – increased automation in cars – we are thinking about a city with autonomous vehicles. Will pedestrians take less care knowing the autonomous vehicles will always stop for them? Serious moral issue for all of us to consider with regard to autonomous vehicles further down the line. Liz Knight, vice chair of the London Road Safety Council is welcoming delegated to the Council’s Centenary Conference. Welcome to a live blog of the London Road Safety Council’s Centenary Conference, ‘Safer Roads, Safer Cities’. We will provide you all the latest information, the important soundbites from the event’s speakers, pictures and more.